Robert J. Sawyer » Blog Archive » Donald Trump is president. How the hell did that happen? by Rob - February 27th, 2017. A year ago, science-fiction writer and futurist Robert J. Sawyer accurately predicted the rise of a far-right psychopath coming from out of nowhere to become the American president, propelled into office by large numbers of people manipulated to vote against their own best interests. Sawyer’s predictions have often come true in the past, but none so quickly or with such far-reaching consequences. 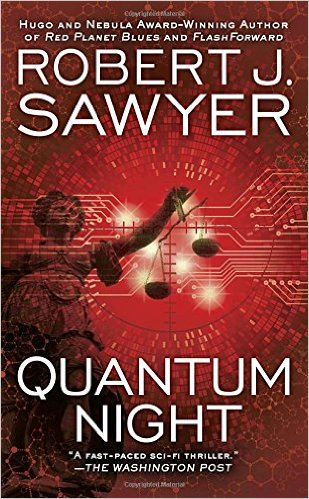 Now, with the paperback release of his bestselling Quantum Night, after its successful run in hardcover, readers can follow along with Sawyer’s characters — an experimental psychologist and an expert on the physics of consciousness — as they come to understand how authoritarians manipulate the masses to follow them … right to the brink of oblivion. Building on the cutting-edge research — including Prof. Robert D. Hare’s world-famous studies of psychopathy done at the University of British Columbia and Prof. Bob Altemeyer’s research into authoritarian leaders conducted at the University of Manitoba (and quoted extensively by Nixon White House counsel John Dean in his nonfiction book Conservatives without Conscience), Sawyer has drawn together the latest in real-world scientific thought to explain exactly how we got to the political situation we find ourselves in today. Sawyer was right in his prediction of a Trump-like president. Will Sawyer also turn out to be right in his prediction of the that president’s next move: an invasion of Canada? Sawyer, a member of the Order of Canada, and bestselling author of FlashForward, which was adapted as an ABC TV series, is one of only eight people in history — and the only Canadian — to win all three of the world’s top awards for best science fiction novel of the year: the Hugo, the Nebula, and the John W. Campbell Memorial Award. As a futurist, he’s consulted with NASA, spoken at Google’s headquarters, and advised Canada’s federal Department of Justice. Quantum Night, his 23rd novel, is his most prescient, and timely, work of prediction to date. 1 Response to Donald Trump is president. How the hell did that happen? I am actually working on a project to create something like Webmind, but there are important difference between it and my designs. I am a bit disappointed with your political bias, but I accept it. Heinlein was a right wingnut… You know what I mean or else I have incorrectly simulated your level of intelligence. Irregardless of that, you have demonstrated a knowledge of game theory, given that, what happens to a population of cooperative agents when a defector appears? Rhetorical question to establish my bonafides. If you can find me w google, we should talk.